Enterprise Resource Planning has long been a quietly productive region of enterprise IT: head down, getting on with the job. It has its origins in Materials Resource (or Requirements) Planning in manufacturing, in the 1970s and 1980s, but then expanded to other industries. And it encompassed financial management and accounting from early on. As a term, ERP was invented by Gartner in 1990, and it has stuck, for good or ill, ever since. An ERP system will typically have software modules for marketing and sales, field service, procurement, and human resources, as well as the core of materials planning and financial management. In more recent years, the four forces of mobile, social, cloud and big data have had an impact on traditional ERP. To take but one example, SAP’s ERP system has been rebuilt for its in-memory columnar database Hana, and presented through its Fiori design language and suite of apps. And it – S/4 Hana – is delivered over the cloud, private and public as well as on-premise. These days, too, it will be invoked as critical to “digital transformation” programmes. And suppliers will say their ERP system is infused with AI – or, more plausibly, machine learning. 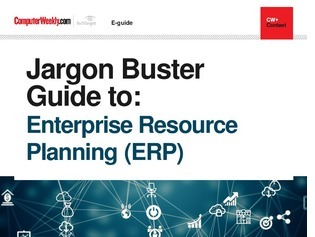 The definitions and articles in this e-guide Jargon Buster take you through this changed ERP landscape.